In our previous posts, we saw that Order Delivery Date Pro for WooCommerce plugin is compatible with various different plugins. This list is increasing and has made it the most compatible, widely used and versatile plugin in the market. Today we will learn about compatibility of this plugin with Flexible Shipping for WooCommerce by WP Desk. This is a new feature added in v8.6 which was released in August. As the name suggests, this plugin provides the most advanced shipping functionalities for WooCommerce stores by allowing you to calculate shipping costs based on weight and/or cart total. 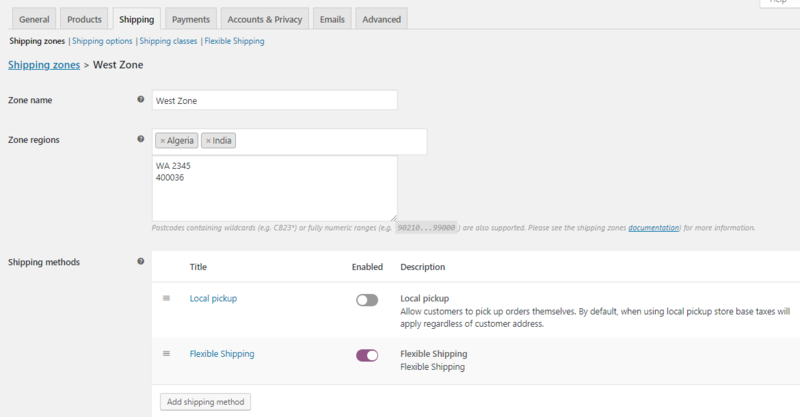 You can set shipping methods for different shipping zones and the custom delivery settings added for it are displayed on the frontend upon selection. Here there are 2 Shipping methods added namely DPD and FedEx where these will be displayed on the frontend when their conditions will be met. 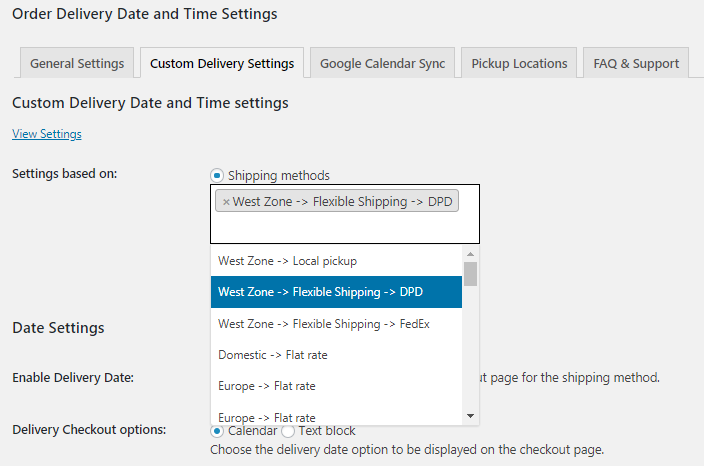 After selecting the shipping method, you can add delivery date & time settings for it from the Custom Delivery Date and Time Settings page which will be displayed as shown below. Here we will take an instance of only DPD Shipping method and explain how it works. This shows that the delivery can take place on Wednesday, Thursday, Friday and Saturday as per the settings added. This will reflect on the frontend Checkout page when DPD Shipping condition is met. Now when you select item in the shopping cart, Flexible Shipping option appears on the Cart page with both the shipping methods displayed as the conditions of both shipping methods are met. DPD shipping method is displayed because the Price for selected item is $500 which ranges between $100 to $500, as shown below. So the charge of $20 is added to the total. 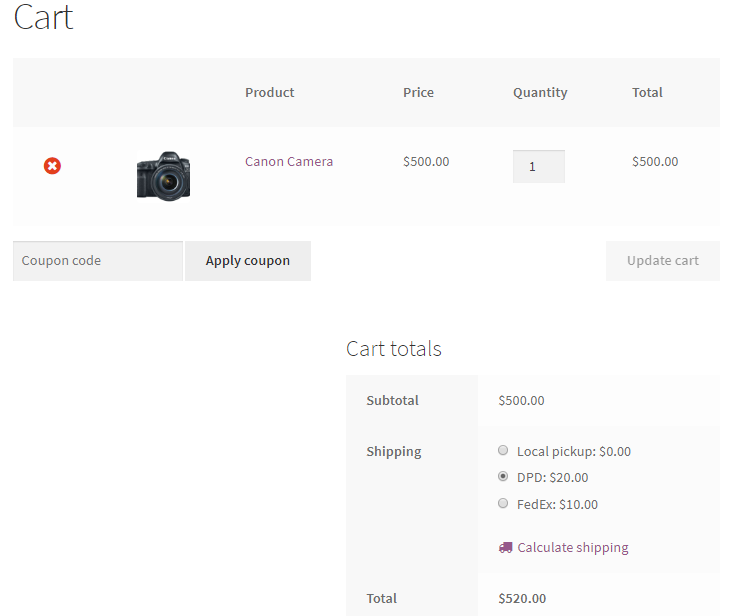 Similarly, FedEx Shipping method is displayed because the Price for selected item is $500 ranges between $10 to $500 and so the charge of $10 is shown. Here as you can see, DPD option is selected on the Cart page, hence the delivery settings added for DPD will appear on the Checkout page. As you can see, the calendar on the Checkout page shows the delivery days of DPD Shipping method enabled. 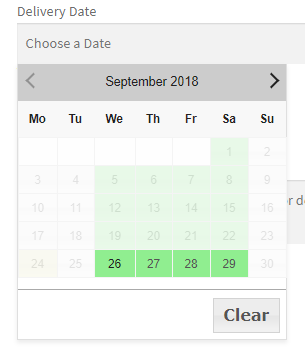 As per the settings added in the backend, deliveries can take place between Wednesday to Saturday, hence you can see only those days are enabled in the calendar. In this post we saw how the compatibility functionality of Order Delivery Date Pro for WooCommerce plugin with Flexible Shipping for WooCommerce plugin by WP Desk works and allows customer to opt for desired shipping option for order delivery. In turn, this helps shop owners to deal with their order delivery process in a quick and easy manner.